There are entire websites devoted to instances when elements of the production of a film (which forms the container) accidentally appears in the final film (the content). I’m looking at you, MovieMistakes.com. More than a typo in a book, or broken code on a website, a visible mistake in a film – such as the reflection of a camera in a doorknob – is more uncanny. Why? My assessment is that film is ostensibly a more immersive medium, its artifice not being as apparent as a bunch of pages with ink on them, for example. 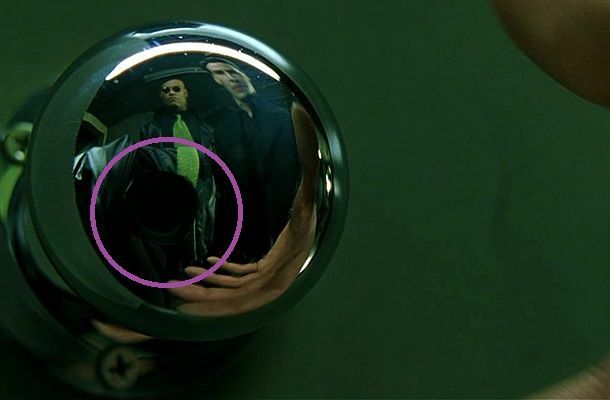 Careful attention to detail during the shooting and editing phases is required to ensure these mistakes don’t take the viewer “out of the story.” And certain shots with mirrors become a bit of a technical hurdle when telling a story in film – think of all the shots that were never attempted or scraped because of worrying about the fourth wall being broken because of simple reflections. Interestingly, in faux-documentaries TV shows like The Office and Arrested Development this intrusion is played with from time to time. Namely, there are running gags – or maybe you could just call them stylistic flourishes – of boom mics entering the frame, intentionally. So whereas mistakes in the films shown in the above clip are accidentally turned into content, those same mistakes are turned into content in those shows intentionally. The container and content become messily combined. Screen Rant. “10 Movie Mistakes That Slipped Through Editing.” Online video. 11 July 2015. YouTube. https://www.youtube.com/watch?v=_TWbD3MKfM. 10 March 2016. The intentional blurring of the distinction between content and container is intriguing. This sort of self-awareness is brought to the next-level in the brilliant (I will defend this choice of adjective) series Trailer Park Boys. In one episode, the boom-mic is not only intentionally visible, the man carrying the boom-mic is ‘shot’ during one of the boys’ escapades. Here, the show’s creators mock the mockumentary, and poke fun at the way viewers read the self-conscious signs of the fake documentary.